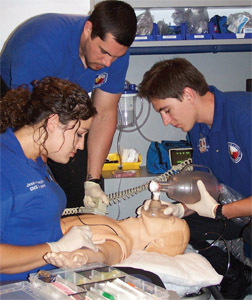 It is the goal of the Blinn EMS Programs to educate and prepare students with the technical skills required for employment in the field of Emergency Medical Services. The program is based on knowledge and skills utilized in prehospital care and emergency centers. This includes but is not limited to: patient assessment, oxygen therapy, medication administration, shock management, bandaging and splinting, cardiac management, medical emergency management, childbirth, pediatric emergencies, and scene management. People’s lives often depend on the quick reaction and competent care of emergency medical technicians (EMTs) and Paramedics—EMTs with additional advanced training to perform more difficult prehospital medical procedures. Incidents as varied as automobile accidents, heart attacks, drowning, childbirth, and gunshot wounds all require immediate medical attention. EMTs and Paramedics provide this vital attention as they care for and transport the sick or injured to a medical facility. In an emergency, EMTs and Paramedics typically are dispatched to the scene by a 911 operator, and often work with police and fire department personnel. Once they arrive, they determine the nature and extent of the patient’s condition while trying to ascertain whether the patient has preexisting medical problems. Following strict rules and guidelines, they give appropriate emergency care and, when necessary, transport the patient. Paramedics are trained to treat patients with minor injuries on the scene of an accident or at their home without transporting them to a medical facility. Emergency treatment for more complicated problems is carried out under the direction of medical doctors by radio preceding or during transport. Paramedics use special equipment, such as IV therapy, cardiac monitoring, endotracheal intubation and medication administration. Paramedics work as part of the flight crew on helicopters or fixed wing aircraft that transport critically ill or injured patients to hospital trauma centers. EMS Program Grading Policy Summary Statement - In order to “successfully” complete an EMS Certification (ECA, EMT-B, EMT-P, LP) course, the student must maintain an 80% average or higher in each EMSP course AND score an 80% or higher on their final exam. Grades are not rounded in the EMS program. Students who meet the requirements will be issued a course completion, which allows the student to take the appropriate certification exam.